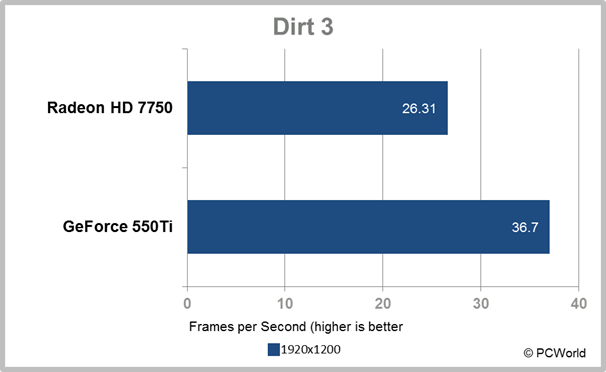 Make no mistake: The AMD Radeon HD 7750 is not a fast graphics card. It will not play the latest games at a smooth frame rate at full 1080p resolution with all the details turned up. You’ll have to reduce the resolution and dial down the features in hot new 3D games to achieve good performance. Still, it’s a nice improvement over integrated graphics, and you can it add it to almost any PC. With the introduction of Intel’s Ivy Bridge processors, new computers really don’t need entry-level, $50-to-$70 graphics cards anymore. But what if you have an older system with less-capable integrated graphics? Though the Radeon HD 7750 isn’t a barn-burner, it is a good step up from integrated graphics, and it does offer some advantages. At around $109 (as of April 23, 2012), it’s inexpensive. The card is physically short and doesn’t require any external power, so you can plug it into just about any desktop system. All you need is an empty PCIe slot--no need to check how powerful your power supply is or anything. The Radeon HD 7750 is the cheap, low-end card in AMD’s new Graphics Core Next lineup, which debuted with the impressive Radeon HD 7970. Essentially, this card has all the technology you can find in that one--only much, much slower. The most direct competitor is the Nvidia GeForce GT 550 Ti, which has fallen in price to the same just-over-$100 level. 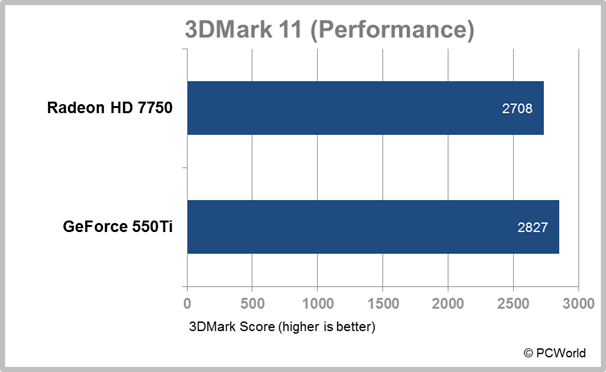 In our 3D graphics performance tests, the 7750 came up a little short behind the 550 Ti. The cards' relative performance in the synthetic 3DMark 11 benchmark tells the tale. In most games, the results were about the same, with the 550 Ti being just slightly faster. The difference is not enough to notice. We encountered a few outliers in our tests, though; in Dirt 3, for example, the difference was not quite so minuscule. On balance, you’ll find that the GeForce GT 550 Ti is a bit speedier than the Radeon HD 7750, but usually not so much so that it will have a dramatic effect on the games and 3D applications you run. 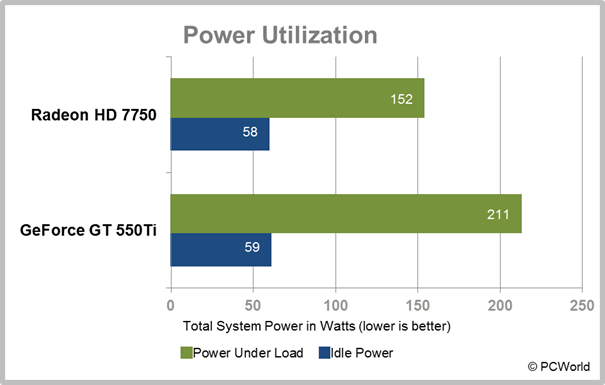 Where you will notice a huge difference, however, is in the power draw: The 550 Ti and 7750 both sip power when the PC is sitting idle at the desktop, but the 550 Ti draws a lot more power when under load. You’ll need a power supply with an available six-pin graphics power plug on it for the 550 Ti, whereas the 7750 can run using just the power that the PCIe slot itself supplies. Clearly, the AMD Radeon HD 7750 isn’t for everyone. Enthusiasts who want to make sure that the latest games run great and look amazing at high resolutions will definitely need more performance than this graphics card provides. PC owners who don’t play any games outside of Facebook needn’t bother. Admittedly, there is a niche market consisting of people who want to play games that integrated graphics can't handle so well, and who might want superior video quality too, but have a limited budget and can't replace their PC's power supply to meet the requirements of a more-capable card. The Radeon HD 7750 fills that niche, but not in an especially impressive fashion. It is capable and efficient, but not much more. If you need a bottom-dollar graphics upgrade that will work in almost any modern PC, this is a good choice. You can get a lot more performance elsewhere for not much more money, though.